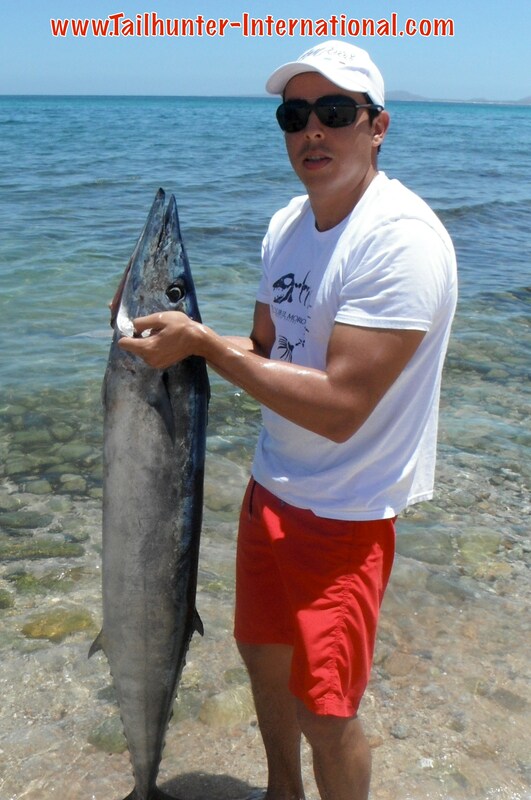 In front of that awesome mustache is a beast of a wahoo! Behind the ‘stache, is Allan Sheppard from North Carolina who got in on the incredible wahoo bite we had this week. They were in the thick of it and actually left the fishing grounds so they could go chase marlin because the wahoo were so thick. They came back 3 hours later and the wahoo were still there! 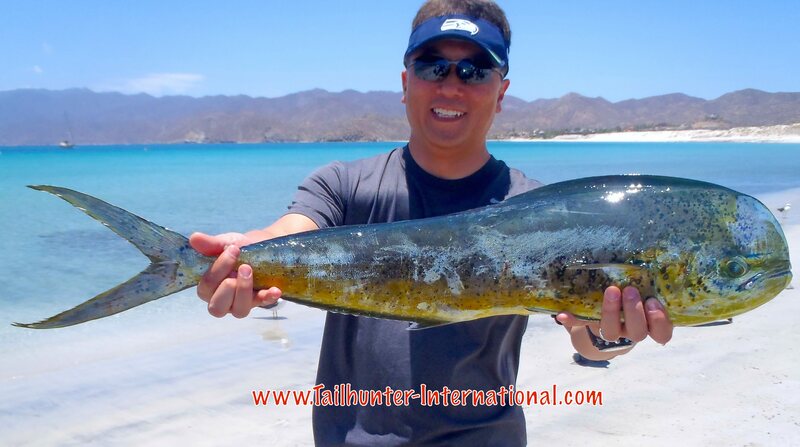 Long time friends and visitors to us here in La Paz at Tailhunter, JD Drucker and Donna Drucker had quite a week. This was just ONE of the day the had! Four wahoo with Captain Victor. 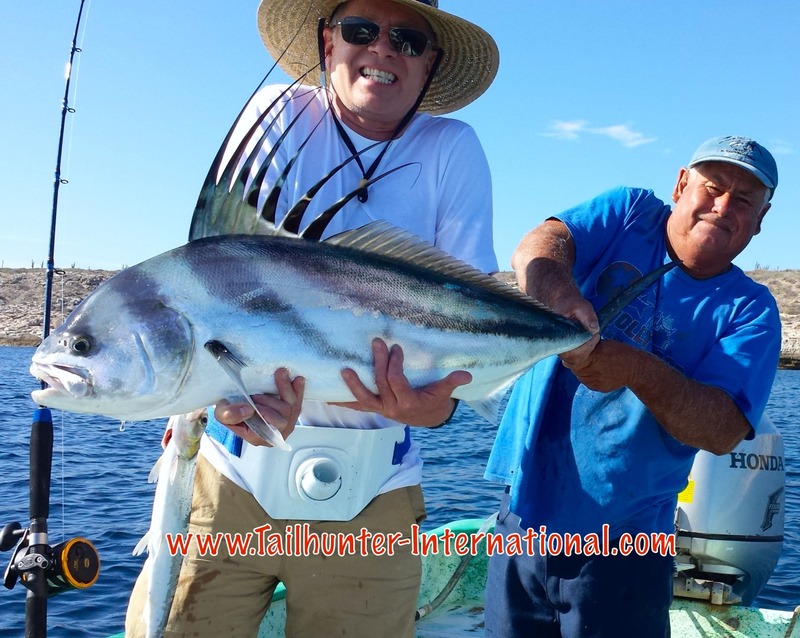 With Captain Pancho, Clarence Foster shows off a dandy beautful roosterfish caught right off the Muertos rocks. Clarence is from Kansas. The fish was released. 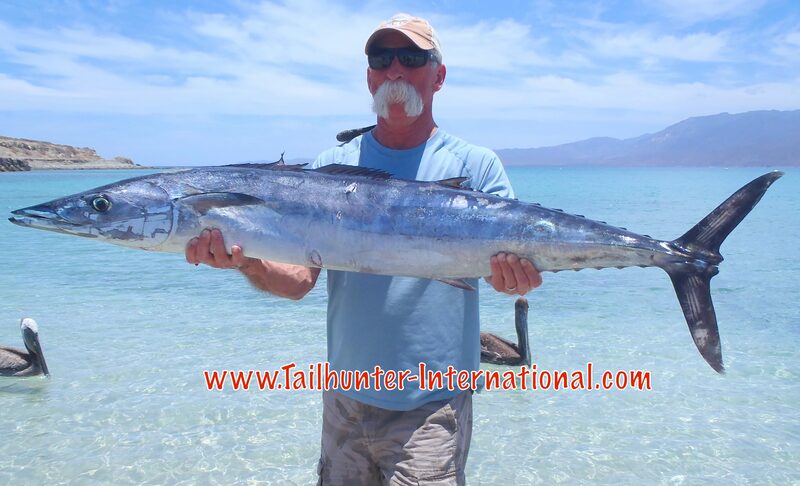 Forrest Parker fronts a big game hunting operation in S. Africa http://wildafricahuntingsafaris.com/ but calls North Caroilna home in the U.S. On his first visit to Tailhunters and La Paz, he shows off one of the larger wahoo of the week! 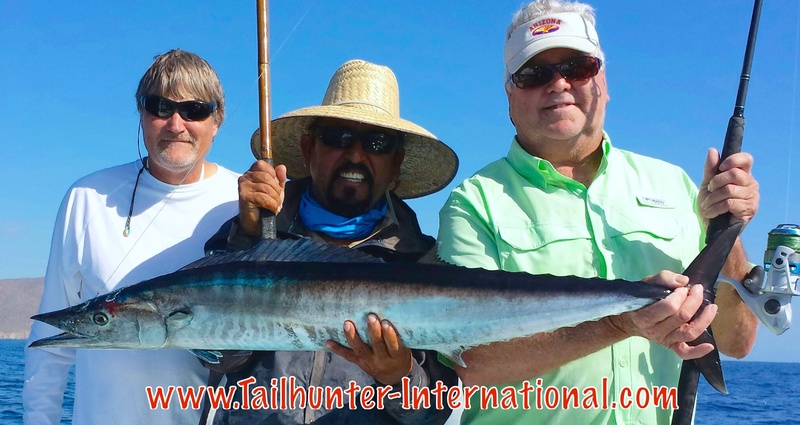 Our Tailhunter Captain Jorge flanked by Clarence Foster and Leroy Freeman and Leroy’s wahoo that he took on a spinning rod! The guys are from Kansas. She got alot of “firsts” on this trip. 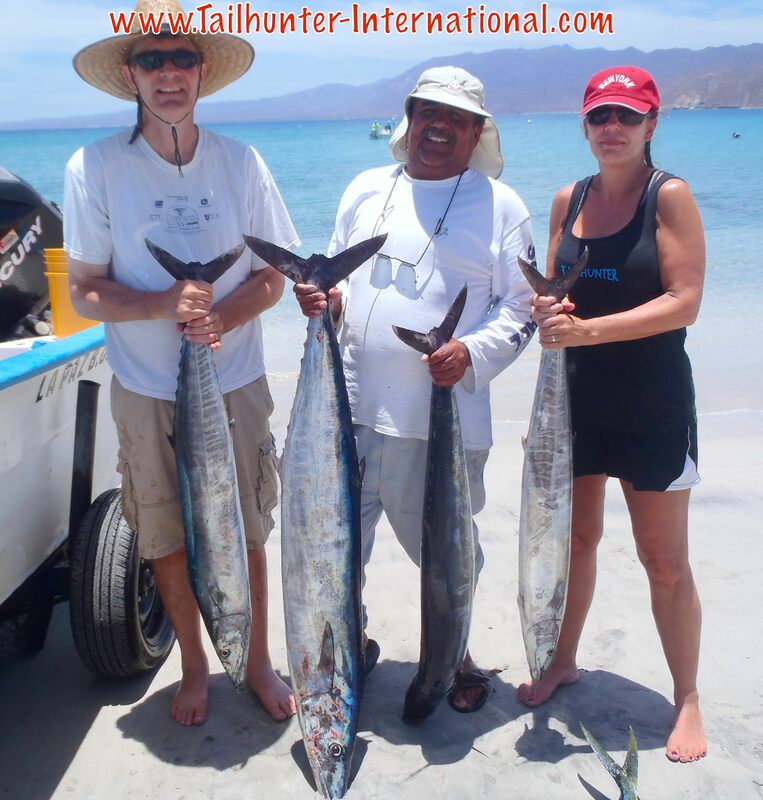 First rooserfish…first shark and here first wahoo for Donna Drucker from Glendale AZ and Captain Victor. Captain Armando helps Tony Maldonado from Palm Springs while buddy Randy Burke from Washington looks on. Both islands producing roosterfish this week. 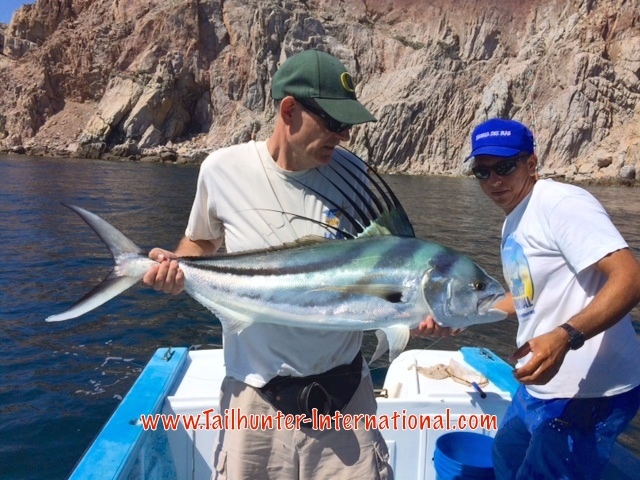 Captain Joel and JD Drucker with a catch and release roosterfish off Espirito Santo Island. 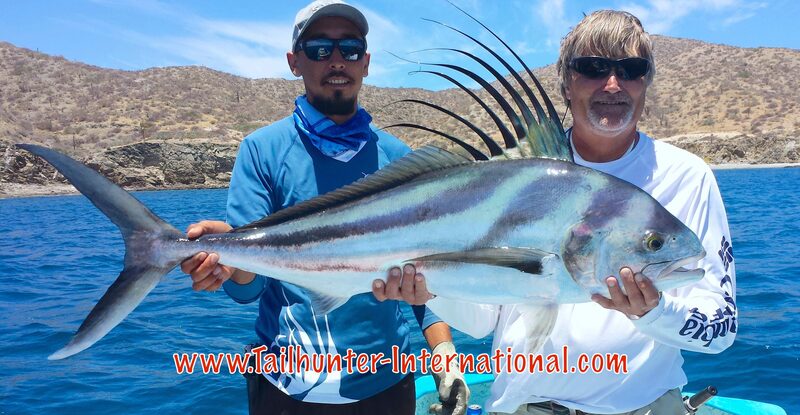 First day luck for Allen Burgess and Captain Jorge with a hefty roosterfish caught and released. Donna Drucker was on fire all week with big fish. Captain Victor strikes a pose to help her out with a big roosterfish that was released right after the shot. 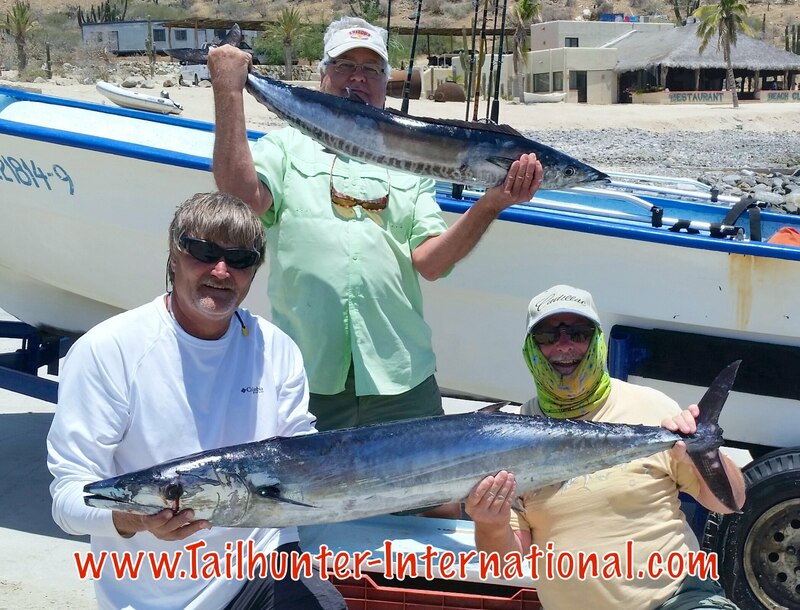 It looks like they have FOUR wahoo, but actually Jim ad Dan Bovee from San Diego have three nice wahoo and a really big sierra! Same family. Same good eats! The boys from Kansas with two more wahoo! Clarence Foster…Leroy Freeman…Al Burgess rocked the wahoo all week! Captain Jorge with another wahoo. This one caught by Dr. Dave Perrine from Washington who declined the photo! Dave had a super week of fishing the big ‘hoo! THE LAST TIME THE WAHOO BIT LIKE THIS WAS….NEVER! What a difference a week makes! After several weeks of scratchy fishing, we had one of those weeks for the books. In twenty years here in La Paz, I have never seen a bite like this. Whatever happened was epic. Two areas. One at the south end of Cerralvo Island on the high spot and then the other right outside Bahia de Los Muertos just off the rocks a hundred yards! Small mackerel…baby sardines…trolled Rapalas…they got bit. A few days were better than others, but there were wahoo everyday this week. I hope I don’t jinx it. These fish were running 20-50 pounds and the crazier part was that some of the rookie guys didn’t realize the prize they had caught…and GAVE AWAY ALMOST ALL THEIR FISH TO CAPTAINS OR ANYONE ELSE WHO WANTED A PIECE!!! It was nuts. In addition to the wahoo…well…we got the rooster fish back in the fold. Not as good as its as two or three weeks ago, but at least we got some to the boat. The fish ran 15-45 pounds on the average and all got released. But, for alot of guys (and gals), it was one to check off the bucket list. Anyway…whew…a much better week. Not everyone caught fish every day like this, but this was the place to go for the larger fish this week. For all the bigger fish, Las Arenas was where the action was happening. For the most action, our La Paz fleets did better. Usually, it’s reversed. 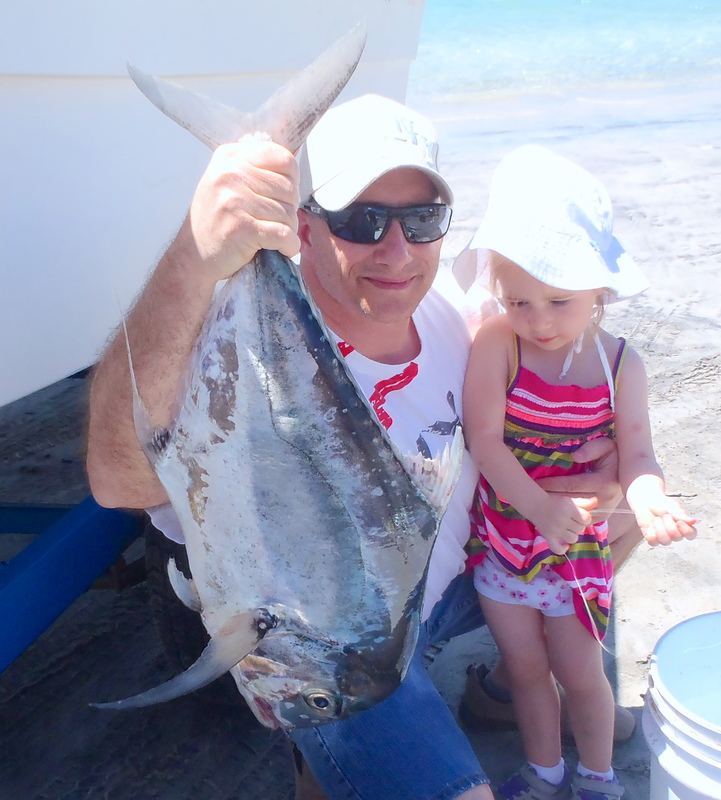 Las Arenas has the variety and action while La Paz holds the larger fish. But, what we had this week was some really really great inshore action along the reefs and islands. 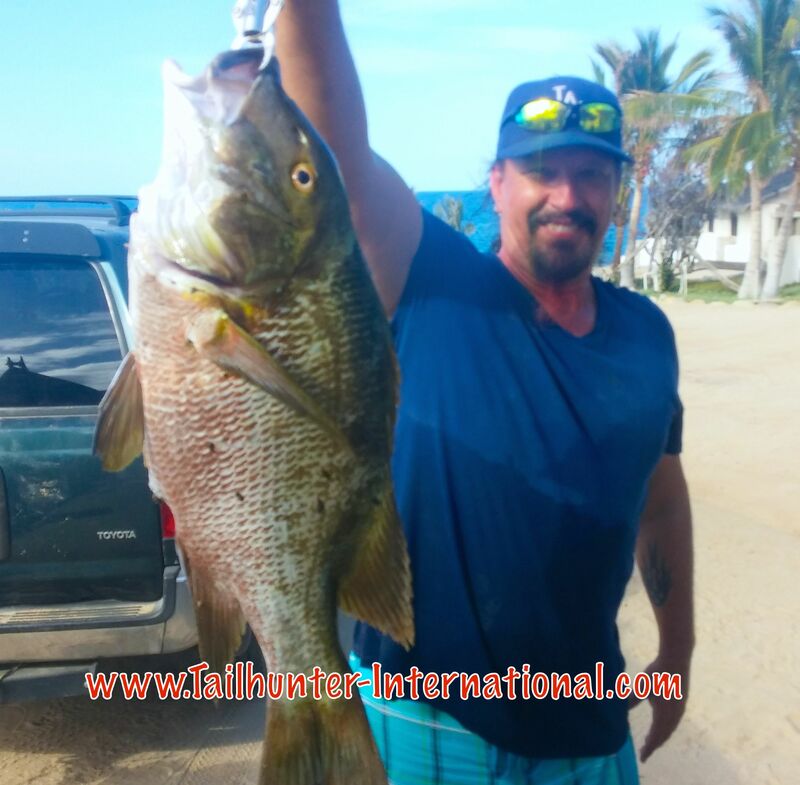 Some sizable pargo (yellow snapper and barred pargo) and some good-sized cabrilla plus some late-season sierra provided some solid action most days. 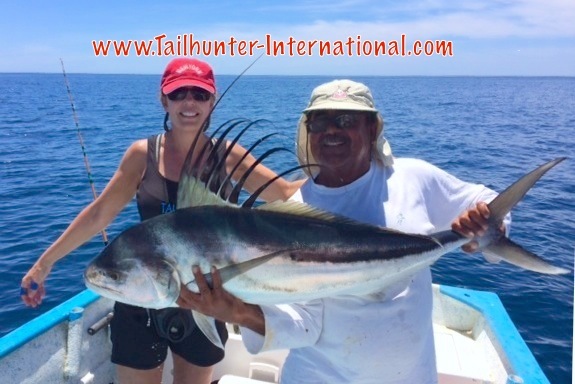 There were also some rooster fish caught and released and we had a few marlin hookups as well with fish getting released or breaking off. There’s some dorado out there, but not in the numbers we’d expect this time of year. More expected as the waters warm up. That’s our story! Happy Memorial Day everyone and thanks to all who served! 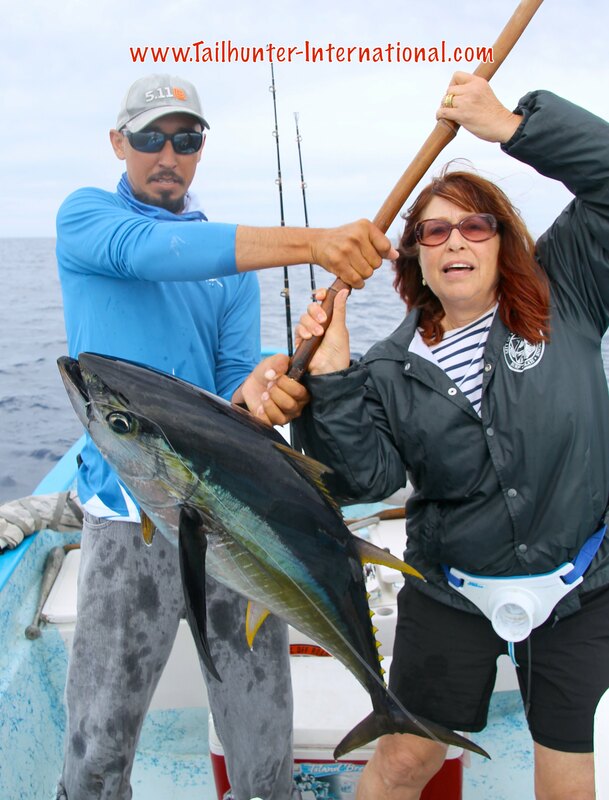 Diana Statman from Marina del Rey CA had never fished in salt water and was a little nervous going out on “that little panga.” But, with Captain Pancho from the Tailhunter fleet, she had a bait in the water only a few minutes and got slammed! Her husband Jay was still rigging up. He got bit shortly after and they had a double hookup going. Here she is trying to hold the big fish still for the camera. 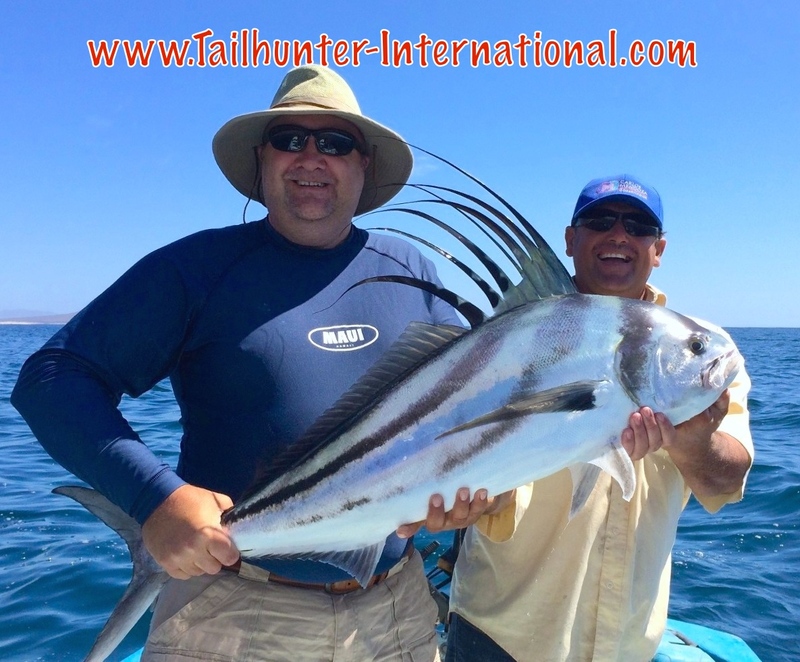 Nice rooster for Allen Burgess from Kansas wit Captain Jorge from the Tailhunter Fleet. 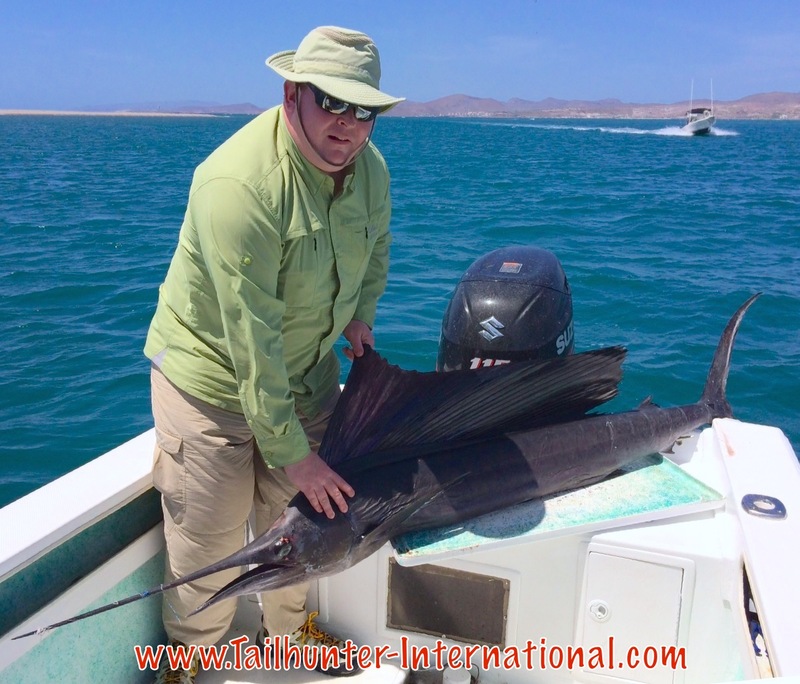 Caught and released off Bahia de Los Muertos. He also hooked and released a 250 pound blue marlin after a 3 hour battle on 40 pound test and a spinning rod. Pretty typical of the nice bite around Espirito Santo Island right now for some great pargo and cabrilla and some of the best fish on the grill or plate. Captain Joel with our good amigo, John Drucker. From Washington, Nyle Miyamoto, with one of our early season dorado no the beach at Muertos. 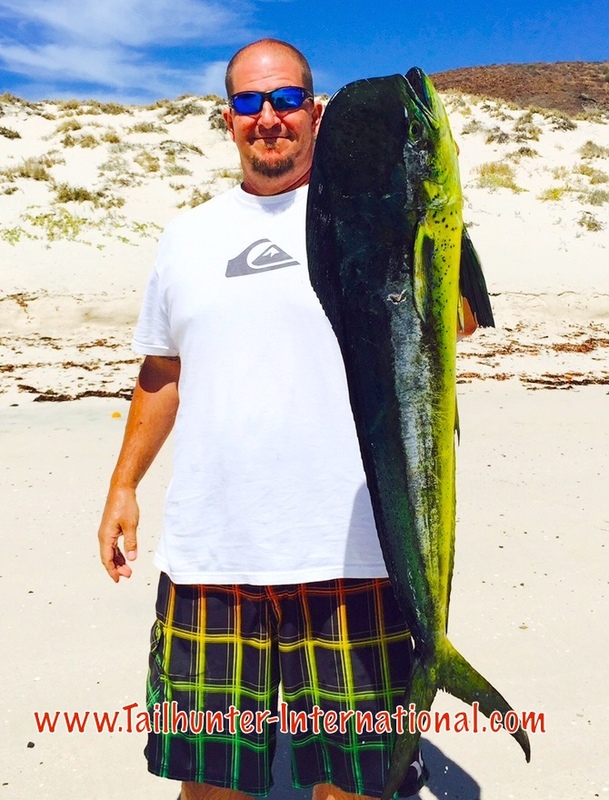 Waters are warming and we expect to see more dorado anytime now. Might be the last yellowtail of the season and caught by Brett Fair and Travis Craig from Portland OR off Espirito Santo Island on big mackerel. 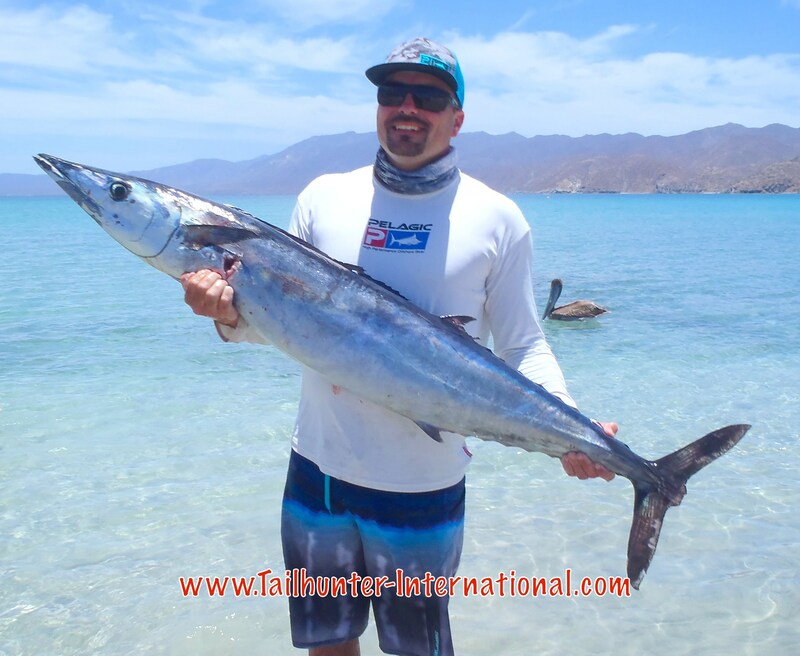 Normally, he’s out white-water paddling, but Mike Dietzman from Oregon was just with us on his first time salt water fishing and he hooked into this nice sailfish north of La Paz. With Captain Chito trying to hook up another bait, Dave Cummins has a fresh one on the gaff. Nice bull dorado off Espirito Santo Island . Check out the great colors! 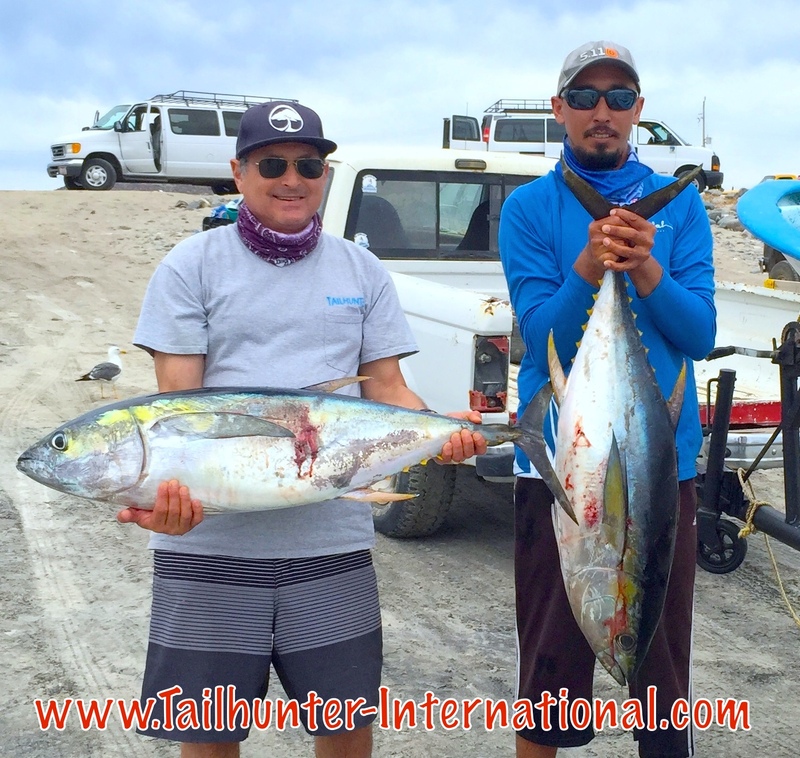 Captain Chito with Jay Statman from Marina Del Rey CA and two great yellowfin tuna out’ve Bahia de los Muertos. Jay and his wife were double hooked and had fish going when a boat load of spearfishing free divers jumped right in the water 10 yards off our panga despite being asked not to do it. That shut off the bite. C’mon…show some courtesy. It’s a huge ocean! Still a nice catch! Mmmmm…one of the best eating fish here! 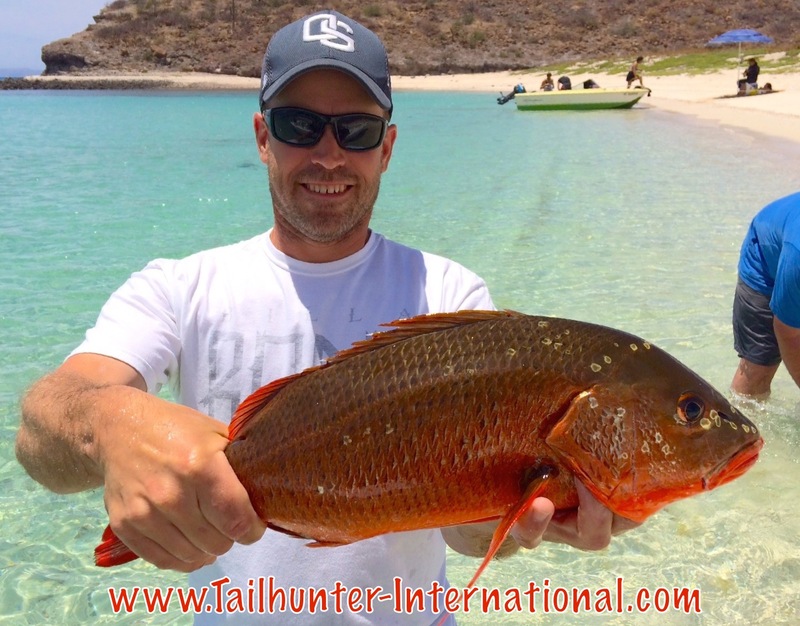 Travis Craig with a huachinango (red snapper pargo) he pulled out of the rocks near Espirito Santo Island. An unusual catch, but they are around here! 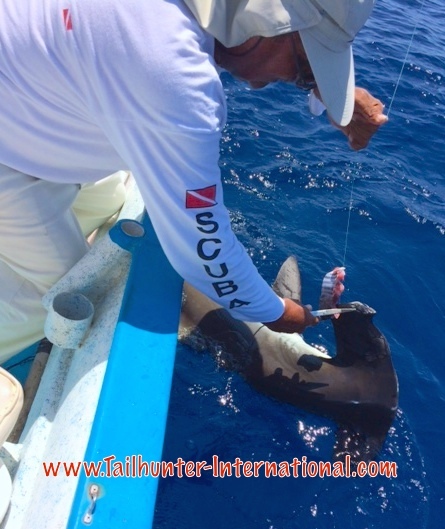 Donna Drucker hooked this 80 pound hammerhead and fought it to the boat so it could be released. It was another tough week after waters and conditions settle down from the strange crazy winds and waves we got the week before that just turned everything over and around. It brought in cooler, greener water plus residual winds and it’s taking quite a few days for things to settle down So, alot of this week was just scratchy fishing and hat’s off to all our anglers who kept grinning and kept patient and brought the smiles. I won’t lie, the fishing was way off what it should be this time of year. There were some great highlights to be sure. But, alot of the week, it was either tough to find bait because of the waters or winds or, when we did find it, the guys had to work hard for their fish. However, with each day of better weather, the conditions were coming back. Each day the waters calmed and so did the winds and little-by-little the fishing seemed to inch better. Probably the toughest fishing the last two weeks. There’s bunches of little dorado around that are entertaining for awhile, but I mean “really little” five pounders, if that. Good for a fish or two to be released, then most anglers move on unless they’re playing and having fun with the light tackle. There’s also some good schools of white bonito around. Again, lots of fun and they’re getting 5-10 per day. These aren’t the “bad bonito” or skipjack. These are the whites that make great eating and can fool anyone on a plate that it’s actually tuna! The meat is not dark, but rather great pink meat perfect for sashime and cooks up white as well. 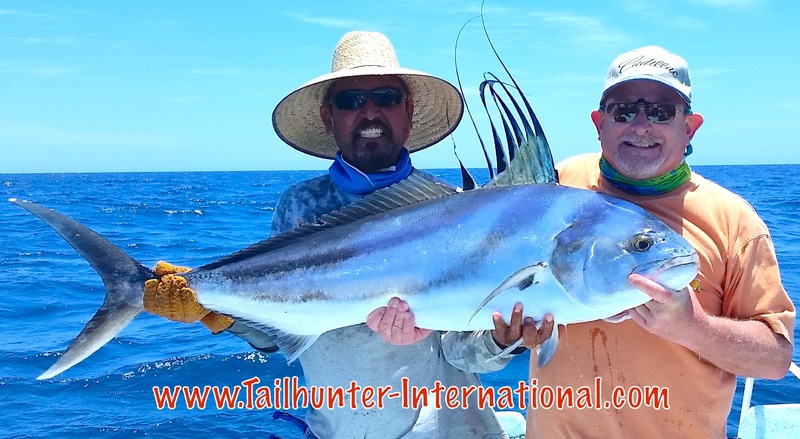 The highlights of the week for our guys…rooster fish. Hard to come by this week with limited smaller baits so we only had the big ladyfish to use, but that produced a few of the bigger 30-50 pounders along the shores. But, the bite was definitely off. We also had more marlin swimming around and one big-time hookup by Al Burgess from Kansas. 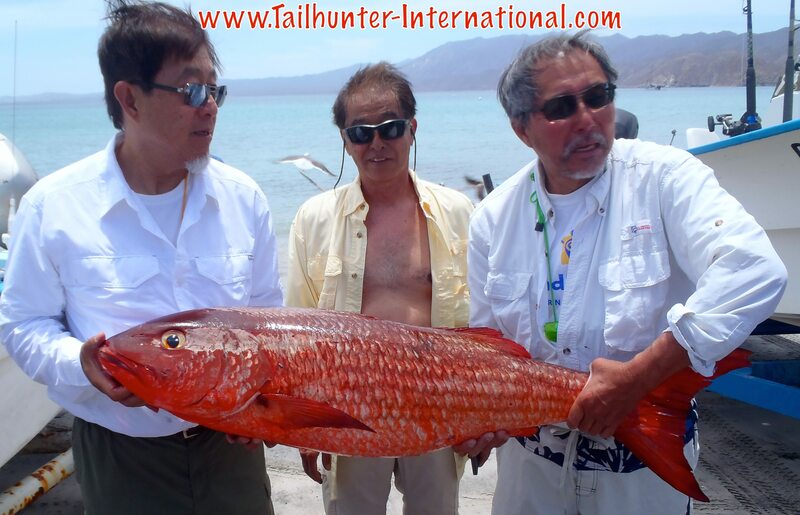 Allen hooked a fish estimated by our captain at 250 pounds! But, even more amazing, Al was using 40 pound test AND A SPINNING ROD! He battled the fish solo for 3 solid hours with a bad back and legs and they said the big fish bulldogged them and barely ever jumped…the worst and strongest kind…smart fish that don’t waste energy jumping around! It pulled the panga with 3 anglers and a captain in circles the entire time. Sorry there’s no photos but what happened is the guys burned up all the batteries and memory during the battle! When the fish was finally alongside the boat, no one had any memory or batteries! Only great stories. And the fish was released!!! Well done! The other highlight was a nice jag of 30-40 pound tuna. Another good story. Diana Statman had never fished in salt water before! 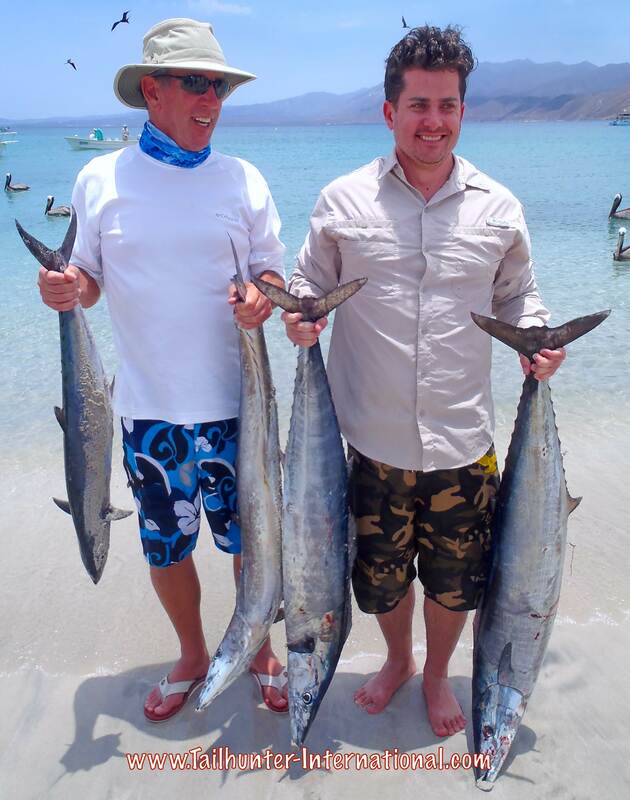 First time down here too, although husband, Jay, is a long time fisherman and has been down to La Paz many times before. Diana gets a bait and gets it in the water and minutes later she’s bit!!! Tuna on!!! Husband Jay is still rigging up! Then, Jay gets bit! Doubles on! But what happens…some private spear fishermen pull up not 10 yards from their panga and jump in the water! Despite being asked to move somewhere else…they jump in anyway. The tuna get pulled in, but bite over! C’mon guys…some courtesy. It’s a big ocean!!! This is surprisingly where most of our action took place this week. And it wasn’t our usual bite. Of all things, with the crazy weather, our captains have found some good spots for some big pargo and cabrilla near the islands and some of the reefs. It’s providing some pretty solid action and they’re losing some big big fish to the rocks and inexperience. Most of the fish that are coming back are delicious 3-5 pounders, but some great stories of 10-20 pound fish lost to the rocks. Plus some big amberjack up to 50 pounds caught at the north end of Cerralvo and larger ones being lost…some right next to the boat up to 70 pounds. We did get a few yellowtail. Normally, we should be getting more this time of year, but waters are warming fast so I think the yellowtail we are getting might be the last of the season. 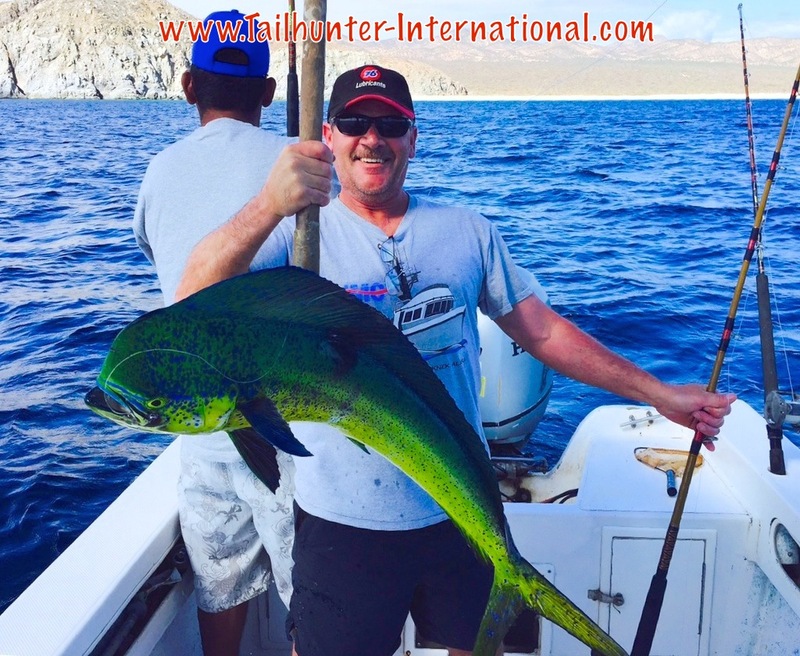 A few dorado around but of the larger variety and we should see more every week and we also hooked a few marlin and sails this week as well. Again, not spectacular and not our usual. But every day seems a little better as long as the weather holds! 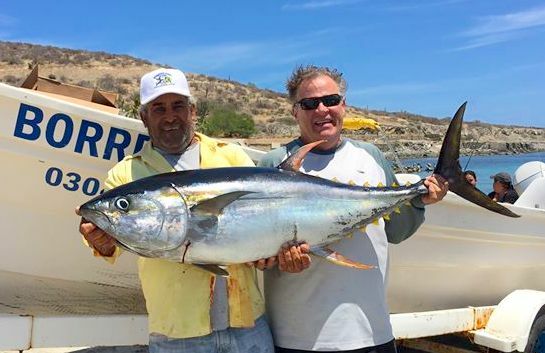 Big tuna for our buddy, Rick Hosmer who tag-teamed with John Nagy and Captain Mundo at the south end of Cerralvo Island. They fought this fish for almost 2 hours on 50 pound test. Flurries of fast movers have been seen at north and south ends of Cerralvo lately! 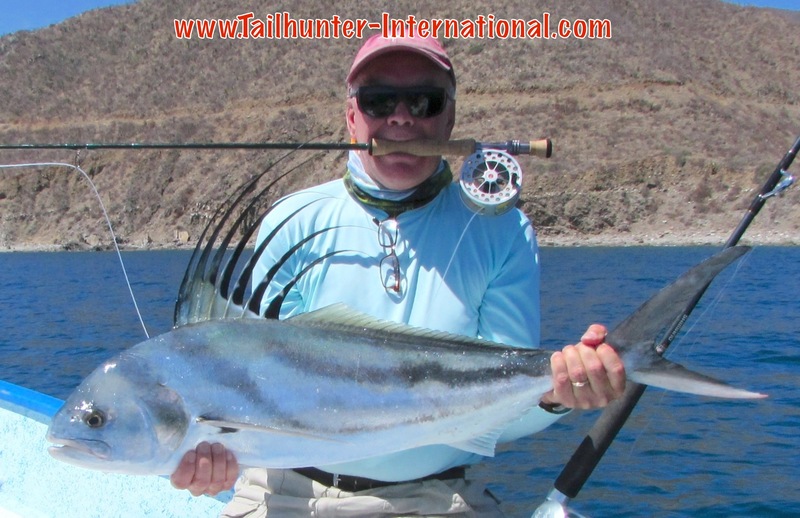 From New Mexico, on his last day of fishing, Terry Price finally landed his roosterfish on the flyrod . They were just outside of Muertos Bay. The fish was released. The ladies really did well this week. 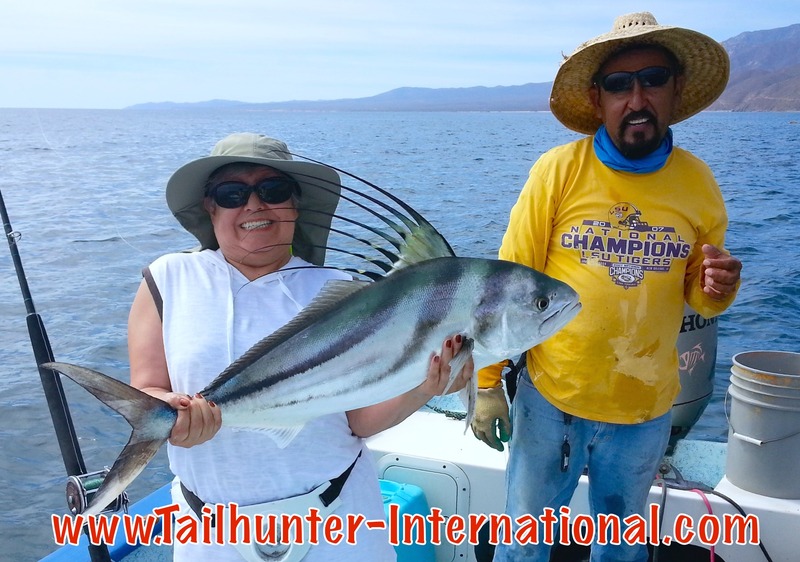 From the Oregon area, Dorothy Murata with Captain Jorge busts a big smile with her roosterfish she took on a live sardine with our Las Arenas fleet. The fish was released. 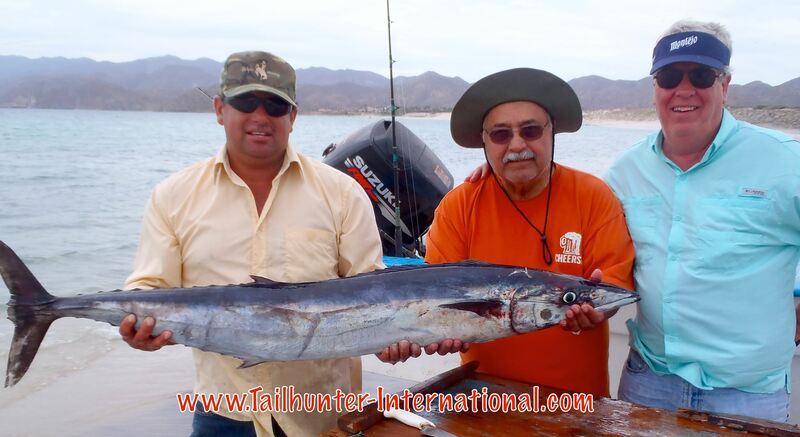 A good day with 2 wahoo and a marlin to show, David from La Paz holds up one of his wahoo. Thanks to Hawk for the great photo. The north and south ends of Cerralvo have been hot spots for the speedsters. She is always in fish! 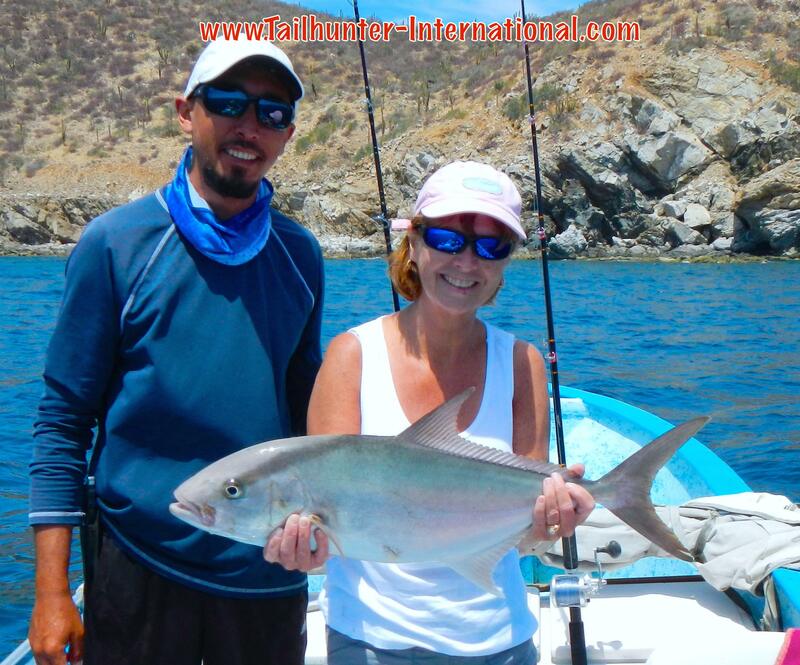 Another of our Oregon amigas who knows how to fish…Debbie White and Captain Pancho pose with a strange-colored amberjack! Most are “amber” or bronze, but this guy didn’t get the memo and is almost albino. 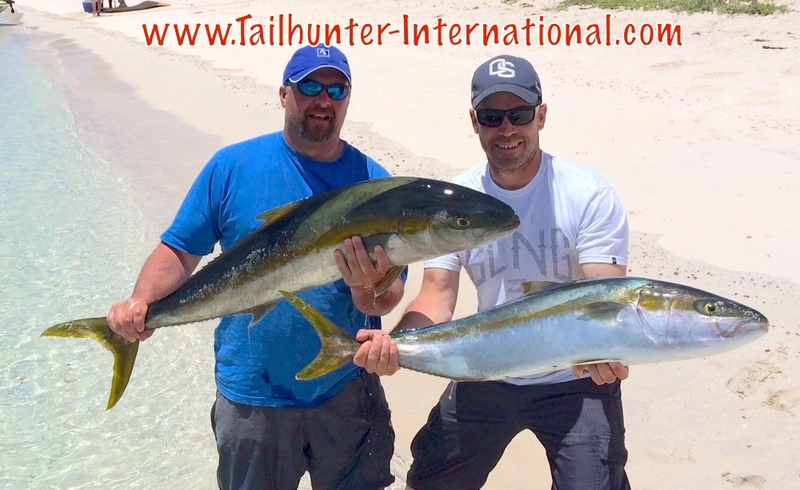 Related to yellowtail, they are great eating and great fighters and get over 100 pounds. Seeing more dorado as the days and waters get warmer. 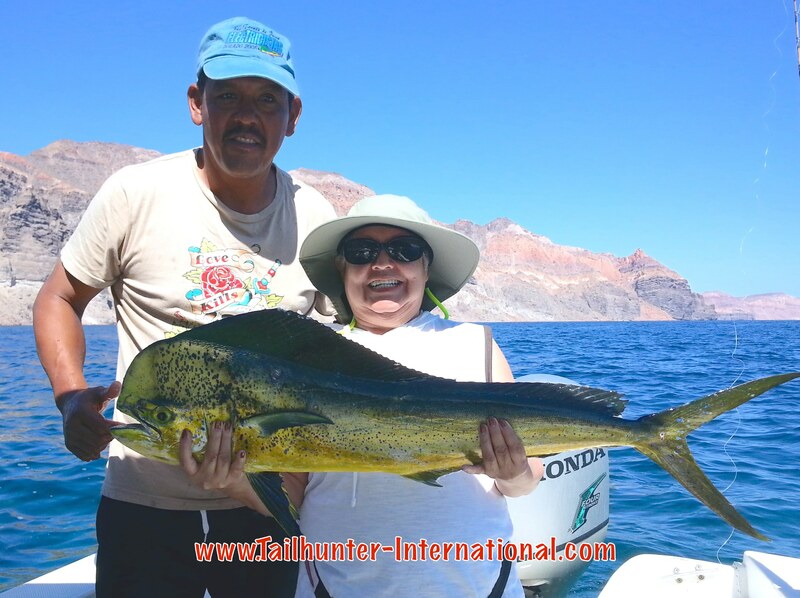 Captain Chito and Dorothy Murata from Oregon pose with a nice bull dorado on the east side of Espirito Santo Island. 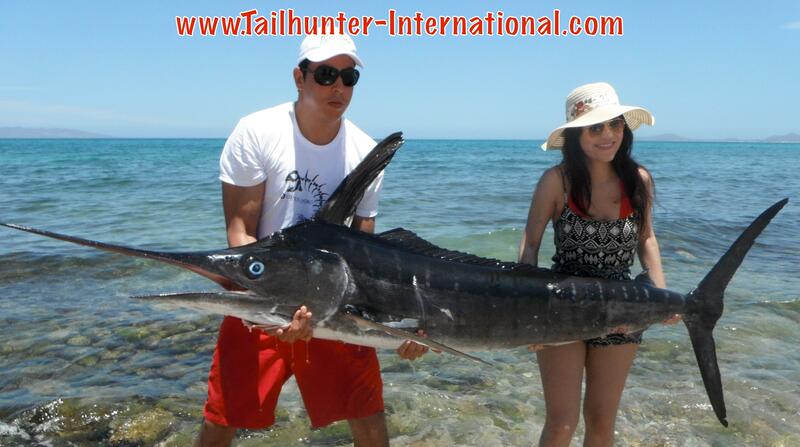 David and Dulce with a small blue marlin that went to the barbecue for the family. They live in La Paz. Thanks for the shot, Hawk! It was a good week on all counts this week. Weather-wise and fishing conditions were more consistent and just-like-that fishing seemed to be more consistent as well. With winds not quite as erratic and seemingly more spots of warm water around, fishing leveled out too. More days of action all-the-way-around which no one seemed to mind. Lately, this has surely been the place for some variety. Nothing wrong with that. If you want a shot at rooster fish, you have your best shot at the early season roosters. Most of the fish are that 20-pound class, but some larger up to 40 pounds have been hooked. The areas are in the usual spots…just around the beaches at the lighthouse and also just off the Punta Perico rocks. Heading south from Bahia de Los Muertos towards Boca de Alamo, there are some larger roosters as well, especially along the shallow rocky areas incredibly close to shore. In the same areas, there’s some big schools of feisty jack crevalle and big pompano as well. Related to the roosters, they share that same tenacious bad attitude. Just like their cousins, the jacks are also not good for eating so everyone releases them, but for sheer fun, it’s hard to beat them. On the other hand, if you stick a pompano, they’re a real treat on the grill or as sashimi! Offshore (for us, “offshore” means 100 yards out! ), there’s schools of bonito. We have several species of bonito and if you get the “toothed bonito” not only are they good fighters, but your captain will tell you to keep them as they are some great eating and not like the skipjack and Mexican bonito that have dark strong-tasting meat and get released. But, you can hook a dozen-a-day of these things. Additionally, we’re seeing more dorado here and there with larger sizes becoming more pre-dominant. More marlin showing which is encouraging. As waters get warmer, I’m sure they’ll turn on. 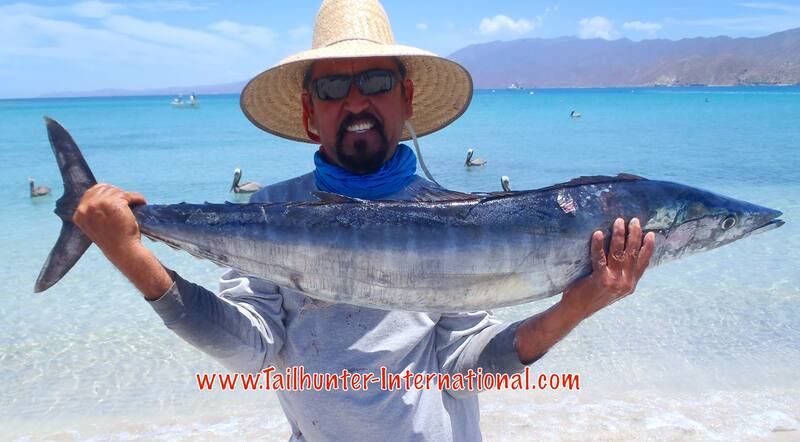 Plus, there’s some wahoo close in near Punta Perico and just this side of the south side of Cerralvo Island. Rapala X-Wraps in 15’s and 30’s in dark colors are producing the best bites. Surprisingly, the inshore action has been quite better than I would have expected. Honestly, the yellowtail bite seems to have gone under so-to-speak. I shut down earlier this year than I would have thought. Blame it on the warm water. However, the rest of the action inshore has rocked for amberjack, pargo, cabrilla, jack crevalle and some assorted rooster fish. 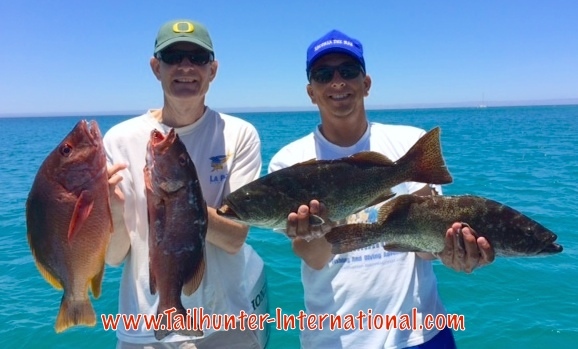 There’s some inshore spots where some of our clients caught and released as fast as they could go. Plus losing lots of fish to the rocks as well and had a blast. 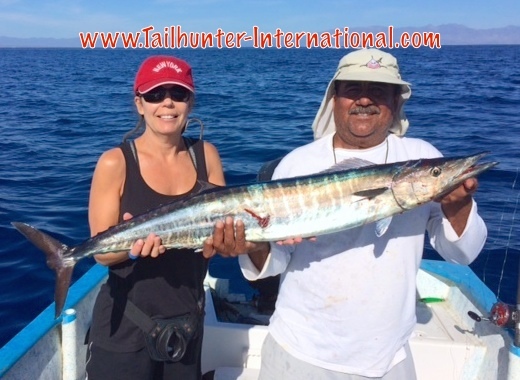 In the blue water, more dorado showing up and we’ve missed a few shots at sunning marlin and sailfish too and had a few wahoo hookups also that were dropped.